The Bell Guest House is an Indo-European building that once hosted European visitors to the Sayla princely state. Set in lush green gardens with shady trees and lawns, this heritage house has now been renovated and opened as a heritage homestay offering the personalized hospitality of the erstwhile Yuvraj and Yuvrani of Sayla. This heritage property is an ideal place to kick back and relax, and experience rural Gujarat in the village of Sayla with its historic buildings, old houses, temples, ashrams, lake, weavers and handicrafts. Those with a bent for community activities and causes can even volunteer for work at the social development and welfare centres in the village. 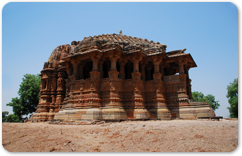 Located at the entrance to the Saurashtra region, called the Kathiawad Peninsula, Sayla is a good place for a stopover for lunch or a few nights stay for those travelling from Rajasthan or Ahmedabad to major destinations like the Gir Wildlife Sanctuary and National Park, Junagadh, Porbandar, Rajkot, Jamnagar, Dwarka, Somnath, etc. The owners of Bell Guest House arrange for guests to visit several birdwatching sites, wildlife reserves, handicraft and weaving centres, holy places and historic monuments in one-and-a-half hours radius of the property. This Guesthouse is geared up for long-staying business visitors to the Surendranagar district in which it falls. This district is a major economic centre for industries like salt, chemicals, pharmaceuticals, solar and wind energy generation, food and beverages, agro-product processing, etc. It is also a key agricultural zone for cotton, fruits, groundnuts, chillies, fresh water fisheries and livestock. 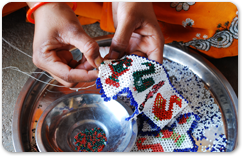 While staying in Bell Guest house, visitors can visit centres for handicrafts like stone carving, metalwork, jewellery making, beadwork and embroidery. You can visit khadi and handloom clusters, and see rare weaves like the Tangaliya and the Ikat. Bell Guest House is an excellent place to stay for those who want to see architectural monuments including medieval stepwells, 12th century temples, fortified towns and palaces, all of them within 50km radius of the property. This is a unique fair that attracts a large number of people to the Trineteshwar Temple. 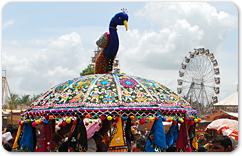 The fair features ritual bathing at the tank of this historic temple, traditional dances of the Bharwad pastoral community and fairground attractions.